Recently listed as a World Heritage Site along with Woolmers Estate, Brickendon is one of the most unique sites you will find in Australia. 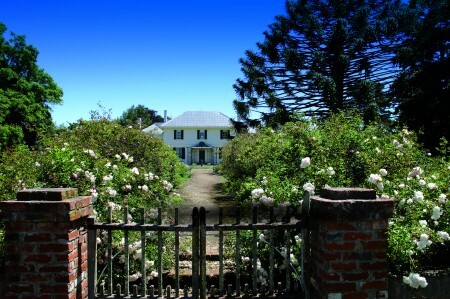 Built by convicts and owned by the same family since 1824, more than 20 heritage buildings to explore, magnificent gardens to wander, farm and river walks, friendly farm animals, river frontage for great fishing and all in all a great place to visit for the day or stay on for the night. Group Bookings for Mondays are welcome. Animal Feeding starts at 10.15 am daily. If you are coming during Winter you will find that the gardens are not in bloom but the amazing 180 year old trees are a feature. Tasmania is a temperate climate and the plants are normally in hibernation during the colder months. The Farm Village is also a little quieter as we move some of the animals into other paddocks to spell them ready for their Spring growth. We do however feed the animals each morning at 10.15am and the buildings are all open for you to explore. Located in the fascinating Heritage Highway Tourism Region, Brickendon is so close to many attractions. Just in the local area there are wineries, honey and sauce factories, bakeries, historic homes, river fishing and guiding, craft and antique shopping just to name a few. Within an hours drive East you could be in the Ben Lomond National Park or meeting the White Knights (huge eucalypts) in the Fingal Valley or going South, discovering the craftmanship of the convicts in the towns of Ross and Oatlands. Then travelling West you could enjoy an underground cave experience at Mole Creek and admire the Yarns exhibit at Deloraine or North to meet our Tasmanian devil at Tasmania Zoo or discover the delights of the Cateract Gorge at Launceston. Whichever direction your travels take you, it is all so close.